CHARLESTON, W.Va. (November 29, 2018) - Due to inclement weather in the forecast for this weekend, the West Virginia Power has announced that its "A Very Power Christmas" event has been moved back one week to Saturday, December 8. The event will still run from 12 p.m. to 3 p.m. at Appalachian Power Park. All of the other details for the event will remain the same. Admission to this Christmas celebration is free of charge and open to all who wish to attend and kick off the holiday season with the Power. There will be games and arts and crafts stations set up all around the ballpark, while everyone can get their photos taken with Chuck and enjoy some warm hot cocoa and delicious cookies. The Power will also be collecting new, unwrapped gifts and donating them to Toys for Tots for children in need this holiday season. In addition, The Power Outlet merchandise store will be open for the entirety of the event, with special deals available on several items. Fans will also have the option to purchase ticket plans for the 2019 season, which are on sale now online at wvpower.com or over the phone by calling the Power Front Office at 304-344-2287. No RSVP is required for this event. 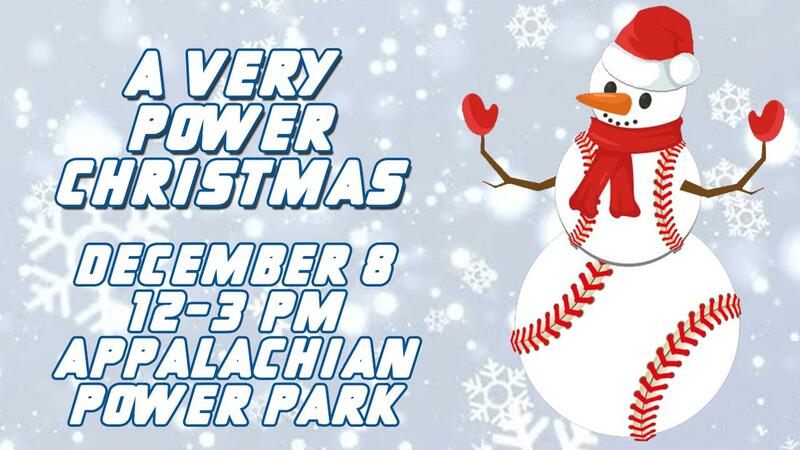 For those who would like more information on "A Very Power Christmas", please contact the Power front office at (304) 344-BATS or visit www.wvpower.com.